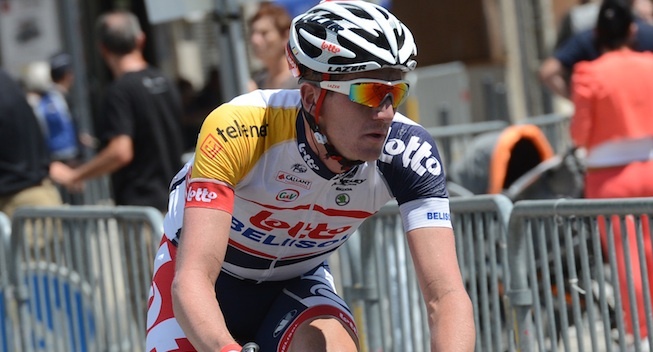 Jurgen Van Den Broeck faces a big test in the Criterium du Dauphiné which starts tomorrow, as the Belgian grand tour star has been told by his Lotto Belisol team that he needs to perform to get selected for the Tour de France. After several weeks of hard training, he feels ready for the challenge. From Sunday 8th until Sunday 15th of June the 66th edition of the Critérium du Dauphiné will take place. This WorldTour race starts with a flat individual time trial of 10.4 kilometers in Lyon. On Monday the riders may start climbing. The finish line is drawn on the Col du Béal, a climb hors catégorie. Before the riders get to the foot of the last climb they will have covered five other climbs already, among it three of second category. The third stage contains two official climbs of second category. The top of the last one lies at 46 kilometers from the finish. After a descent there are 37 flat kilometers to go. The fourth stage takes the rider from nougat town Montélimar to Gap. 12.5 kilometers before the end lies the top of the Col de Manse, next it goes downhill towards the finish. In the stage on Thursday there are six climbs on the course, of third or second category. The last official top is about twenty kilometers away from finish place La Mure, but it continues to go uphill, also a bit further in the final. The riders will pass the finish a first time at just over sixty kilometers from the end. On Friday it's in theory the least tough stage – apart from the time trial - with three climbs of fourth category and a hilly final. The penultimate stage arrives at Finhaut-Emosson on an hors catégorie climb, the second one in a distance of thirty kilometers. The riders can warm up with two climbs of second and one of first category. The final stage is just over 130 kilometers long and finishes in Courchevel (first category). In the first half of the stage the peloton has to get over a climb of second and first category, in the final there's another mountain of first category before going to Courchevel. The Tour de France starts in less than one month. Tour favourites Alberto Contador, Chris Froome and Vincenzo Nibali will further prepare themselves in the Dauphiné. Froome was the overall winner of this race last year, his teammate Richie Porte got second and Dani Moreno third. They will stand at the start as well. Jurgen Van den Broeck, who did a training camp in the Sierra Nevada last month and did a recon of the Tour stages in the Vosges, Pyrenees and Alps talks about his ambitions for the Dauphiné. Next to Van den Broeck Lotto Belisol can rely on among other Bart De Clercq, Tony Gallopin and Pim Ligthart. "After the classics I took rest for one week and then I did some training in Tenerife," Van Den Broeck said. 2Afterwards I took off on a sixteen-day training camp in the Sierra Nevada. Then I did a recon of some Tour stages in the Pyrenees, Alps and Vosges. In 33 days time I've hardly been at home. "The reconnaissance of the mountain stages and cobblestone stage is in any case a good training, but all details can be important in the Tour; like a descent or the run-up to a col. That's why the recons are important for the peace of mind. "The Dauphiné is some kind of exam for everybody. No one with ambitions for the Tour comes to ride here without a goal. You can already feel some of the Tour atmosphere during this race. "After my crash in Tirreno-Adriatico I didn't have a good experience in the Vuelta a Catalunya and País Vasco. When I started training in Tenerife it all changed, that was good for my morale. Now it's a race and afterwards one can judge. I completely want to go for it. It's an exciting period and I'm curious to see where I stand. Hopefully all efforts I've done can turn out in a good race. "With the time trial on the first day of the Dauphiné it's already full gas from the start. On Monday it's a tough stage with a summit finish. After those first two days I will already be a bit wiser. Also Saturday it's a tough stage, but in between there are tricky stages as well. "The plan is that I will stand at the start of the Tour on the 5th of July. I did everything I could to be ready. In the Dauphiné I want to prove that I'm competitive. Today it's three years since I won a stage in the Dauphiné, who knows I can take a victory again this year. "The team doesn't put any pressure on me, but nonetheless I feel a responsibility towards the team, sponsors, family and myself. I'd love to show that I'm ready to everybody that's involved and supports me."